The three Cayman Islands, Grand Cayman, Cayman Brac and Little Cayman, are located in the western Caribbean about 150 miles south of Cuba, 460 miles south of Miami, Florida, and 167 miles northwest of Jamaica. George Town, the capital, is on the western shore of Grand Cayman. 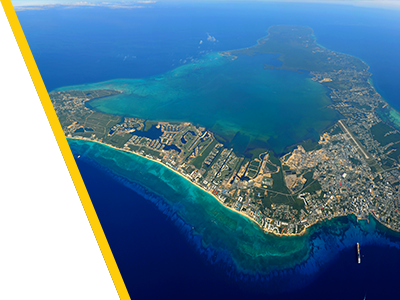 Grand Cayman, the largest of the three islands, has an area of about 76 square miles and is approximately 22 miles long with an average width of four miles. Its most striking feature is the shallow, reef-protected lagoon, the North Sound, which has an area of about 35 square miles. The island is low-lying, with the highest point about 60 feet above sea level. Cayman Brac lies about 89 miles northeast of Grand Cayman. It is about 12 miles long with an average width of 1.25 miles and has an area of about 15 square miles. Its terrain is the most spectacular of the three islands. The Bluff, a massive central limestone outcrop, rises steadily along the length of the island up to 140 ft. above the sea at the eastern end. Little Cayman lies five miles west of Cayman Brac and is approximately ten miles long with an average width of just over a mile. It has an area of about 11 square miles. The island is low-lying with a few areas on the north shore rising to 40 ft. above sea level. Check out our infographic on why the Cayman Islands is better for business! 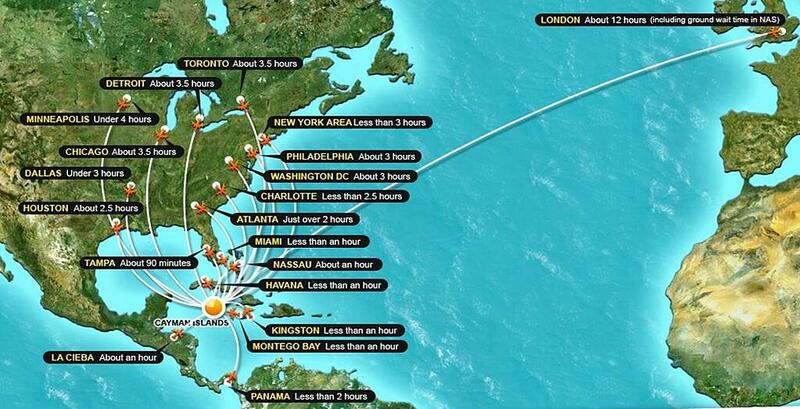 It is easy to travel between Grand Cayman and the rest of the world. International flights run daily from the Owen Roberts International Airport (GCM) with direct flights available to several cities in the United States, Toronto, London, Nassau, Havana, La Cieba, Panama, as well as Montego Bay & Kingston, Jamaica. Map provided by Cayman Islands Tourism Association (CITA). The temperature, summer or winter, seldom goes lower than 70°F. or higher than 90°F. The average is 78°F. in the winter and about 86°F in the summer. The average annual humidity in 2010 was 77 percent. Rainfall varies over the Islands and seasonally. In 2010 rainfall totaled 60.3 inches. The wettest month was September with 14.9 inches recorded. The driest month was March with 0.2 of an inch recorded.